Home Politics Economics Climate change and water woes drove ISIS recruiting in Iraq. Climate change and water woes drove ISIS recruiting in Iraq. SHIRQAT, IRAQ – It was a few weeks after the rains failed in the winter of 2009 that residents of Shirqat first noticed the strange bearded men. Circling like vultures among the stalls of the town’s fertiliser market in Iraq’s northern Salahaddin governorate, they’d arrow in on the most shabbily dressed farmers, and tempt them with promises of easy riches. “Join us, and you’ll never have to worry about feeding your family,” Saleh Mohammed Al-Jabouri, a local tribal sheikh, remembers one recruiter saying. Two agricultural labourers in Azwai, a blink-and-you’ll-miss-it farming community just south of Shirqat, ran off to join the jihadists in December 2013. Seven more from outlying villages followed a month later. By the time the Islamic State (also known as ISIS) seized this swath of Iraq—along with most of the country’s west and north—in a brutal summer-long blitzkrieg in 2014, few locals were surprised to see dozens of former fertiliser market regulars among its ranks. And then when Saddam Hussein rose to power in 1979, he swiftly sucked Iraq into a series of conflicts that struck farmers disproportionately hard. He press-ganged tens of thousands of agricultural labourers into service for the eight year Iran-Iraq war. That conflict left many farms desperately shorthanded and saw the repurposing of much farm machinery for military use. Hussein torched some of southern Iraq’s most bountiful date plantations for fear that Iranian saboteurs might use them as cover to attack oil facilities around Basra. Where once 12 million palm trees stood, there’s now just miles of dusty scrubland laced with oil spills. 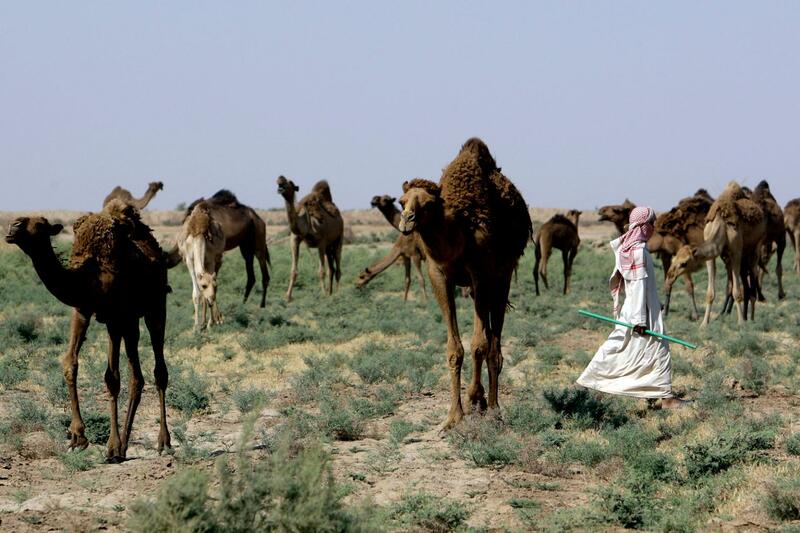 An Iraqi shepherd leads his camels in search of water in the Kut Desert, about 180 kilometres south of Baghdad. The country has seen years of drought, which ISIS recruiters exploited to attract followers. Years of below average rains in the Kurdish region and Nineveh governorate, the only parts of Iraq where rain-fed agriculture was historically possible, had increased the country’s dependence on the Euphrates and Tigris, the Fertile Crescent’s two great rivers. At the same time, upstream Turkey and Iran were relentlessly damming them and their tributaries. Turkey has built over 600 large dams, including dozens of major ones near the Iraqi and Syrian borders. The Tigris and Euphrates’ combined flow in southern Iraq has subsequently shrunk so much that the Persian Gulf now barrels up to 72 kilometres upriver at high tide (the rivers used to project freshwater up to 5 kilometres out to sea). Some 39 percent of those polled in Salahaddin cited drought as a reason for their displacement. Studies from neighbouring Syria, large parts of which enjoy similar conditions to northern and western Iraq, suggest that anthropogenic climate change has tripled the probability of long, debilitating droughts. Soaring temperatures also began playing into these groups’ hands. Amid unprecedented heatwaves, farmers pumped more water in order to keep their crops alive, but in so doing merely added to the burden on the aquifers, many of which were already struggling to keep pace with demand that had previously been met by the rains and rivers. After several years of energetic groundwater extraction near the oil refining town of Baiji, Samir Saed’s two wells ran dry in early 2014, forcing him to lay off the two young men he employed as farm labourers. Jobless and angry, he suspects they soon joined ISIS. Above all, though, the jihadists expertly exploited the desperation in Iraq’s agricultural heartland by rationalising its inhabitants’ woes. They spread rumours that the Shia-dominated government was delaying crop payments and cutting off water to Sunni farmers. In fact, the lack of rain wasn’t due to climate change, but really a man-made ploy designed to drive Sunni landowners from their rich fertile fields, their emissaries suggested. Broke and unable to deal with their fast changing environment, many farmers ate it up. A large majority of the Islamic State’s Iraqi foot soldiers hailed from rural parts of the country’s west, north and centre, terrorism analysts say. 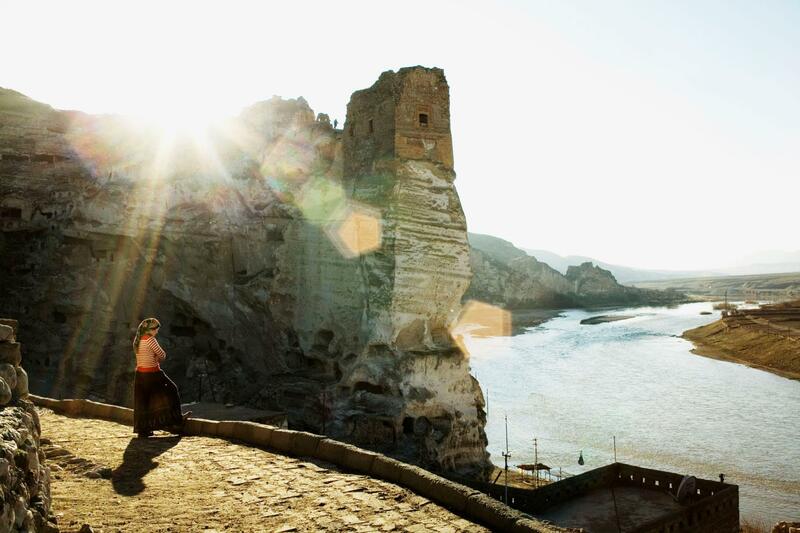 Turkey has built more than 600 large dams, in some cases flooding ancient cities like Hasankeyf, above. The dams has decreased the amount of water flowing across borders into Iraq and other countries. The jihadists adopted scorched earth tactics as they were beaten back, laying waste to hundreds of thousands of acres of prime farmland. And so for returning farmers, climate change and shoddy governance are now among the least of their worries. ISIS fighters ripped up buried irrigation pipes to mould makeshift mortars. They poisoned wells, blew up water canals, and carted off everything that was of any value, notably generators, tractors, and water pump parts. In Tharthar subdistrict, some farmers are still paying instalments on enormous crop pivots they can no longer use. More or less broke after the oil price crash, the Iraqi state can’t afford to pay farmers for crops they’ve delivered to state silos, let alone cover the multi-billion dollar agricultural clean-up bill. “Until all of this is fixed, farming in Iraq is dead,” said Naif Saido Kassem, until recently director of the agricultural office in Sinjar, to the north of Mosul. He estimates the agricultural damage in his subdistrict alone at $70 million. Some farmers still have hope. “We are tough. We will come back like we always have in the past,” said Ahmed, who grows wheat, barley, and some fruits near Dibis, northwest of Kirkuk. But against the backdrop of a climate of distrust so severe that the security forces are blocking most fertiliser from liberated farmland for fear that it might be used in making bombs, few share his optimism. If Iraq can’t get a grip on its crumbling environment, the next war might not be far off.